Join us for a four part series on Financial Acumen for the Young Professional. Attend all four sessions for special financial products and offerings provided by Mereaux Wealth Strategies. The Financials for Millennials sessions are led by Jamar Jones of the Jaynect Group. This session provides the importance of the 401K, the process of truly understanding your plan & its rules along with discussion about investments and other options to grow your personal income. Jamar Jones (@JamarCJones) is a native of southern Louisiana, where he attended the University of New Orleans. He played collegiate basketball in Mississippi before moving to North Texas and discovering his true love, Financial investing. Jamar has over 10 years of experience working ias an investment professional. In 2014, he founded Kinwest Capital Advisors, which works with Millennials in creating a well-crafted plan for their financial future. Jamar is also the Executive Director of Jaynect Group, a nonprofit that Jamar founded that has a documentary produced entitled Choices. 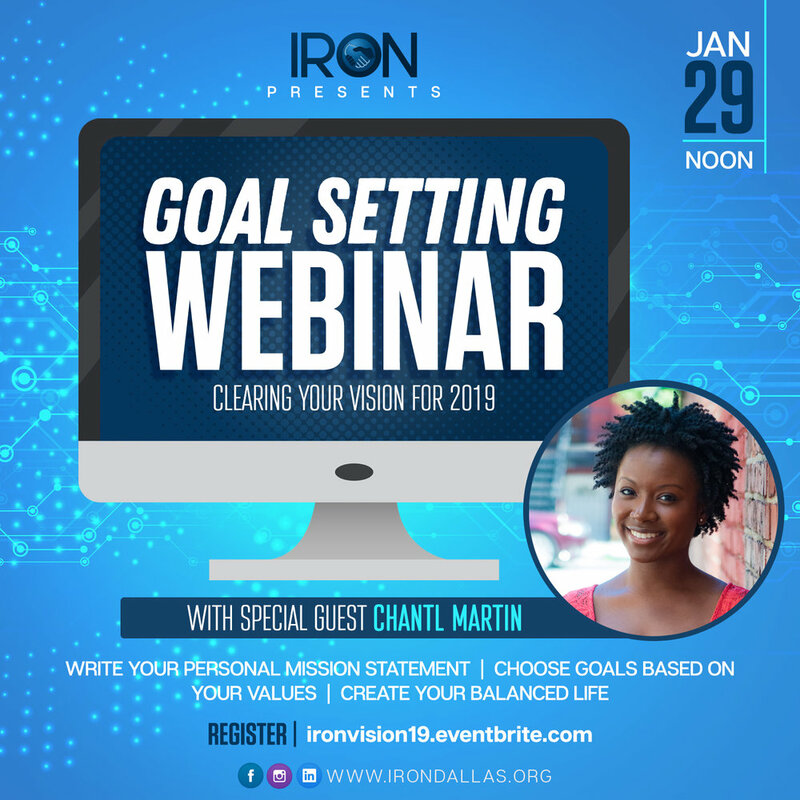 Young professionals from various industries gather to discuss a new concept IRON is sharing with the Dallas community, #ACT. So how do you respond when you hear about things that are happening in the community that you dont agree? IRON wants to encourage you to #ACT (Ask questions, Collaborate, and Tell your story). IRON is committed to connecting young professionals with each other, senior members of our community, and the community as a whole. Come join us and learn on how you can impact Dallas. The way it works: Our C3 events are our unique way to Network and Learn in a relaxed environment. When you register you will receive background information to allow you to have an informed conversation with your peers. The same information is shared with the conversation catalyst. We provide the catalyst with conversation topics and questions to make sure that everyone is challenged to have a conversation that makes an impact. Join us for a four part series on Financial Accumen for the Young Professional. Attend all four sessions for special financial products and offerings provided by Mereaux Wealth Strategies. The Financials for Millennials sessions are led by Jamar Jones of the Jaynect Group. This session provides the importance of the 401K, the process of truly understaning your plan & its rules along with discussion about investments and other options to grow your personal income. IRON is celebrating its 1st year of being an organization. Join us for Professional Development topics during the month of November. IRON is providing speakers for United Black Ellument (UBE) for their professional development series- Building Leaders and Cultivating Knowledge (BLACK) if you or someone you know needs these free sessions please share. Is your resume preventing you from advancing your career? Have you updated your resume recently? Are you still using the same resume using that Microsoft Word template? Come get challenged on how you can move your resume to the next level. Join Devoreaux as she walks you through what the modern professional woman or man should look like for every occasion. For more information about Devoreaux and her fashion blog, check out The Prep Pursuit here. Modern Etiquette/What's Next (Continuing Education)? Attendees will receive information on building your personal brand. Ever heard people talk about etiquette? How does the modern day professional man or woman carry themselves? Have you considered going back to school? Is the military an option? Maybe you have just considered opportunities to advance your career. Come learn about some opportunities from professionals. Come learn how to impress business colleagues with your professionalism. Attendees will receive up to date information on current hiring practices by hiring managers. What is the approrpriate way to prepare for an intereview? Are you negotiating salary? Are you leaving the interview without closing? Come learn how to sharpen your interview skills. Education Matters: Young Professionals Impact on the Dallas Education System. 50 Young professionals from various industries gather to discuss topics as it pertains to being an African American young professional in Dallas. For this event we have invited 5 conversation catalyst in the Dallas Education system. Learn from them how you can directly impact the education landscape in Dallas through volunteer, mentor, and sponsorship opportunities, As usual join us after the conversation for cocktails and cupcakes.... and this time JAZZ Stay afterwards to enjoy live Jazz at our venue sponsor Chocolate Secrets. Please register to receive bios on conversation catalyst and conversation topics! Live Jazz Featuring Nina Katrina. Live Music, Fine Wine, Gourmet Chocolate and Indescribable Desserts. "Come for the Taste. Stay for the Experience." Join us for Jazz in the Atrium at the Dallas Museum of Art. The Music of Thelonious Monk- Dave Zoller, composer, arranger, and pianist, returns to Jazz in the Atrium to perform the music of Thelonious Monk with his group Evidence. The quartet is made up of leading musicians from the Dallas jazz scene. Join us for Conversations, Cocktails, and Cupcakes! 40-50 Young professionals from various industries gather to discuss a diverse set of topics as it pertains to being an African American young professional in Dallas. Emerging leaders and tenured leaders are invited to serve as panelists to help facilitate discussion. Join us after the conversation for cocktails and cupcakes. IRON Dallas Development Program "Navigating the Workforce"
Individuals that participate in the year long development program are invited to attend. Additional tickets for dinner only session may be available.